Obviously, what visitors want is the key factor to make a successful business. However, requesting users to navigate a page, and filling a form is not acceptable for majority of them. They would not pay enough time for thousands of websites who are asking about feedbacks. Therefore, MouseStats Micro Surveys provides a light and sticky gadget to be placed website pages. There is no need to leave the page, or do any complicated task to fill the survey. Just it will be displayed an anyone can simple fill with a few clicks. You are allowed to create your own custom surveys. Not important how complicated is your survey scenario. MouseStats is able to provide you custom fields, multiple option answers and displaying messages in multiple steps. Also, you can define an action for each option or step. Assume a simple scenario. You can ask for their vote about product quality, and if they answered it is "Great", just display a "Thanks" message or navigate them to pricing page. If they chosen "Poor", let them to provide you feedback and ask Why? You can implement this survey within a few minutes. No coding is required at all. If you faced with any confusion, just send us your preferred scenario, and we will implement it in your account on your behalf. We encourage you to let us help, even if you are on a free plan. 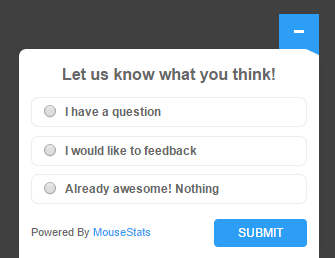 To make it more awesome, we are providing MouseStats Visitor Surveys at no cost. They are absolutely free. If you are a paid member, or if you are on free plan, just start creating your first survey now. If you are not a member, just choose a plan and get started. Start creating Surveys now. Get started with a free test plan without credit card.